One of those carpenter brothers sets up a stand next to his house each summer and sells organic produce from his family's large garden. They grow wonderful sweet corn, and I think I ended up buying most of their early tomato harvest last year, since I didn't get my tomato plants in the ground until (please don't try this at home) July. The stand is run on the honor system so you can shop even if they're not home; the reasonable prices are posted, and you just leave your money in the coffee can on the table, making change if you need it. 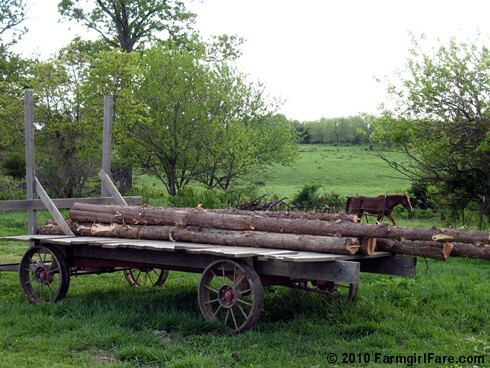 Picturesque horse drawn buggies now dot the landscape, and we get to see cool things like the wagon pictured above. I'm really enjoying the cultural diversity. But best of all? 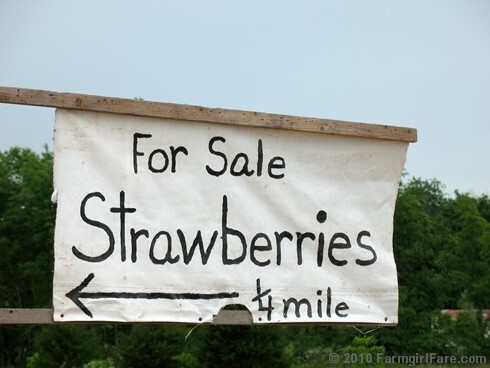 This time of year, three of the Amish families sell organic strawberries. 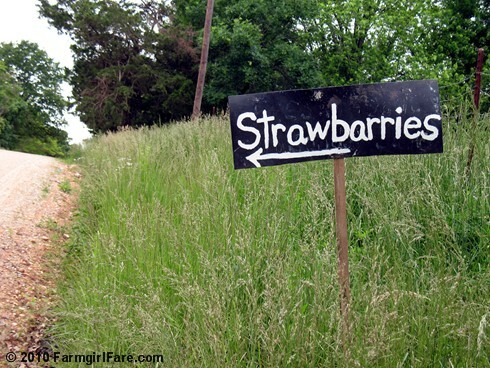 My favorite way to eat strawberries is standing outside next to the berry patch. My second favorite way is alongside a slice of this moist, not overly-sweet Orange Loaf Cake that I first wrote about two years ago and have been enjoying ever since (it's also very nice with blueberries). If you feel like going all out—which I highly recommend—then serve your orange cake and berrries with big scoops of some really good vanilla ice cream, preferably for breakfast. Delicious no matter what the spelling. Eating seasonally essentially means that you devour your fill and then some so you won't desire that food again until next year. The two of us managed to wolf down 13 quarts of fresh strawberries over the past several weeks. Our craving has definitely been satisfied. © 2010 FarmgirlFare.com, the sweet and juicy foodie farm blog where this is the first year I didn't harvest any strawberries from my own berry patch (due to severe neglect, wet spring weather, and amazingly vigorous weeds), and as disappointing as that was, it sure was nice not having to worry about those strawberry ravaging turtles! Love thy neighbor as thyself. Amish take their religion seriously, as seen in their forgiving attitude toward the man who killed five of their little girls in their schoolhouse. You cannot have better neighbors than the Amish. And thanks for your very neighborly blog that I enjoy every day. Great post! The Amish have always fascinated me. I think they have a lot they could teach us about how to live at a slower, more peacful pace. Staying away from computers and the television helps a person do that, at least for me. Those strawberries look delicious! 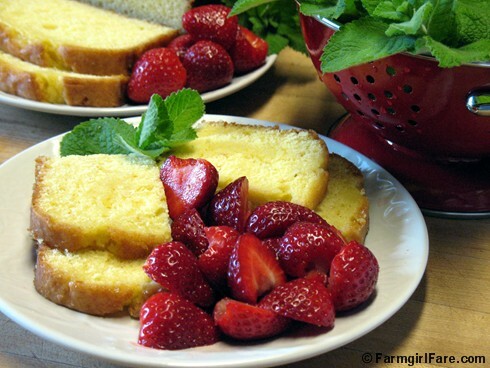 I love fresh strawberries and must try your orange cake one of these days. Soon, I hope. Lovely post,as always. the Amish are absolutely AWESOME. They come down from Lancaster PA every weekend to sell meats and produce at our local Farmer's Market. I no longer buy meats from the grocery store. Such a big difference in quality and taste. Good neighbors are a gift from god... I thoroughly miss our Italian neighbors who moved on last summer. We used to swap recipes and goodies all the time. My mouth was watering looking at the cake and strawberries. A definite on my to do list! My comment isn't related to this post, but I just wanted to say hi. I'm enjoying reading this so much! I'm a lifelong city boy, who has some country/wilderness blood in his veins. Reading your stories about life is so good for my perspective on life and living. So thank you!